Moving to Oliver British Columbia | Why Choose Oliver? I have received plenty of emails from people who have questions about moving to Oliver BC. It is always fun to help answer people's questions from a local's point of view. This post is for those of you who are dreaming of moving to the sunny Okanagan but don't know which town or city to choose. I hope I can entice you to give Oliver a look! My family has lived in Oliver since 2000 and we are truly in love with this area. Having lived most of my early years in Penticton, my husband and I knew that we wanted to stay in the South Okanagan when we were deciding where to settle down. Since Oliver has some of the cheapest real estate in the Okanagan we ended moving to this quiet town when we were first time home buyers and we haven't looked back since. Oliver has a population of under 5000 people. If you like to live in a town where it is easy to get to know your neighbors, this is it. When we go out into town we are pretty much guaranteed to run into someone we know, and we like that! Even though the population is small, everything we need is in town. On the occasion where we can't find something, it is a quick half hour hop into the larger centre of Penticton. Oliver has all the charm of the Okanagan. It has its own small lake to swim in, several swimming spots on the Okanagan River, numerous orchards to get your fresh fruit fix at, and of course we are famous for our wineries! As I mentioned, Oliver has some of the cheapest real estate in the Okanagan. Compare prices here to those of neighboring cities of Penticton and Osoyoos and you will be pleasantly surprised by Oliver's affordability! Whatever your dream home, Oliver has lots of different properties to choose from. In the town limits, you will find homes built in the 1940s all the way to brand new homes in new and modern subdivisions. If having a little more property is on your wish list you don't need to go far out of town to find homes on acreages, whether you are looking for 1/2 an acre or 10 acres! It is easy to find a small hobby farm, an orchard, or even the perfect land for starting your very own winery! Most of the shops in Oliver are clustered around the downtown area. From quaint boutiques to dollar stores, shopping in the downtown core is as easy as taking a walk down main street. For your grocery needs, Oliver boasts two grocery stores, a Buy-Low Foods in the South end of town and a No Frills in the centre of town. If you are looking for big box stores Oliver has a Canadian Tire and a Mark's Work Wear House. There are plenty of pharmacies to choose from, a bakery, and two liquor stores. There are several options for dining out in Oliver. We, of course, have several fast food chains but the charm of dining out in Oliver comes from the family-run restaurants and, for a little more luxury, the several winery restaurant establishments. From pizza, to gourmet burgers, to Chinese, to Indian, to five-course meals paired with wine, Oliver has something for everyone. For a complete list of dining in Oliver check out our Restaurant page! We aren't called the Wine Capital of Canada for nothing! We've got the dirt and the climate for growing grapes and there is no shortage of wine loving enthusiasts who are flocking to Oliver to make wine! With over 20 wineries in the immediate surrounds of Oliver, this is the place to come for a wine tour. The summers in Oliver are hot and dry. Temperatures hover in the low 30's for most of the summer and can climb up to a scorching 38 degrees in the beginning of August. If you like the sun and the heat you won't be disappointed in our summers! Summer is the time to keep cool and head to the beach. Oliver has its own lake called Tucelnuit lake. The beach there has both sandy and grassy areas as well as a playground for the kids. This is the spot that our family loves to have picnic dinners! The Okanagan River runs straight through the centre of Oliver and offers several swimming spots to cool off in the cool river water. And of course, in Oliver, we are famous for what we grow here in the summer. Imagine eating fresh fruit and vegetables straight from the source for a fraction of the price of the grocery store. With the numerous fruit stands surrounding Oliver, it is easy to support local farmers and eat like a king. If you don't mind picking your own fruit there are plenty of U-Pic operations that will save you even more money and provide a unique opportunity to get more involved in your food production. If you are into gardening then you will be amazed at what you can grow here. Summer is long and vegetables thrive. Our family eats out of our garden from May to November! Just as Summer is a draw for so many people coming to Oliver, so too are our winters. Why? Because it is the mildest winter in all of Canada! A cold day in Oliver is -10 degrees and a typical winter day will hover around zero. We might get a hand full of snow dumps in Oliver each winter of a few inches and the snow will typically melt within a few days. For those of us (me!) who dislike the cold of winter, this is a great place to spend it. For those of us who love winter sports, you don't need to rule out Oliver! Mount Baldy is only a half hour drive and Apex Mountain Ski Resort is about one hour. Both of these mountains offer plenty of snow for outdoor winter enthusiasts. Oliver has two Elementary schools. On the East side of town there is Tucelnuit School and on the West is Oliver Elementary School. We have a brand new high school, South Okanagan Secondary School, a state of the art building with many features including the beautiful Frank Venables Auditorium. One of our family's favourite past time is walking or biking down the Oliver Hike and Bike Trail. The trail is 18.4 km long of which 10 kms are paved. In the summer we enjoy riding our bikes to find swimming holes along the Okanagan River and spending a few hours splashing in the cool water. If you are looking for beach time check out the Rotary beach at Tucelnuit Lake. If you enjoy non-motorized water sports then Vaseux Lake is the perfect place and is only a short drive away! There are plenty of hiking opportunities close to town including McIntyre Bluff and Stamp Mill Trail. In the winter locals head up to Mt Baldy for fun in the snow including snowmobiling, cross country skiing, and skiing! Oliver Kinsmen Spray Park is a beautiful park right in the centre of town. Here you will find a playground and a spray park for the kids to cool off in the summer. Lions Park has a great playground for younger kids, a basketball court, and a skate park! Oliver Parks and Recreation offers numerous programs throughout the year and its facilities include an indoor skating rink and a fantastic outdoor pool. If you have a family we highly recommend the summer swimming lessons for kids! The Oliver Regional Library has an enormous selection of books as it is part of the Okanagan Regional Library system where you can request books from any of their numerous branches and have them delivered right to the Oliver library! There is a small museum in Oliver as well as the Oliver archives for those history buffs among us! Oliver also has the coolest movie theatre in the Okanagan. It is a one-room movie theatre with a great sound system, offering movies (and yummy popcorn!) at a fraction of the price of the big box theatres elsewhere. There is a lot of fun to be had in Oliver! Every Thursday night in the summer you can enjoy Music in The Park alongside a small market. We have two major festivals, the Sunshine Festival and The Festival Of The Grape which are both a lot of fun to attend. Many of the numerous wineries offer live music and special events throughout the entire year. For a detailed listing of updated events in Oliver visit our events page! 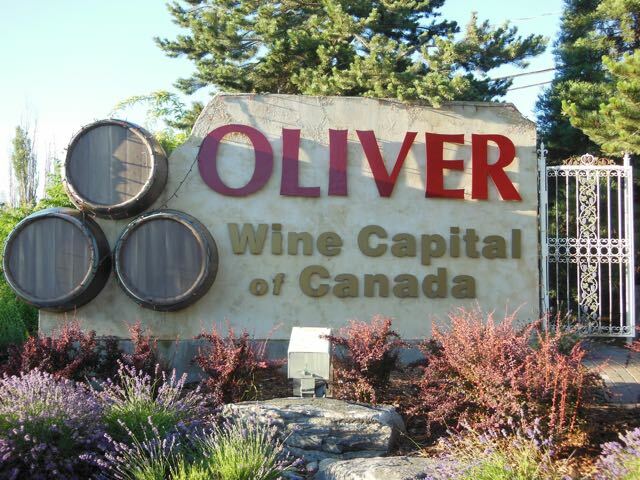 Oliver is a small Okanagan town that is big on charm! If you are looking for a place to live in the Okanagan Valley come for a visit but be warned, you may just fall in love with it as we did!